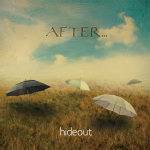 More information: 'Hideout' is the second studio album of the prog-rock band AFTER from Poland. Their first CD 'Endless Lunatic' oscillated towards neo prog rock. The album featuring Colin Bass and Jozef Skrzek was brillantly received in Poland and abroad. 'Hideout' shows a more matured musical style of the band, is based on two guitars. The production (by Zbyszek Florek of Quidam, masterring done by Grzegorz Piwkowski) is excellent. Despite two faces of the album, one heavier and the second more 'traditional' prog, this is a great CD.